Skype is probably the number #1 video calling software. Even though it started to be used by families who live apart, sometimes in a different country, or by companies to interview a potential employee, to talk to specific customers and suppliers and so many others. However, you can’t record your video calls in Skype. Though there are a lot of software that allow you to record Skype video call. While some work only for Windows, others only work for Mac. And in this article, we will show you how to record Bandicam on your Windows PC. To record Skype video call with Bandicam, the first thing you need to do is to get the right settings on both your computer, Skype, and on Bandicam as well. Let’s check all these right settings on Bandicam, Computer and Skype. Open the Bandicam software. On the top menu, you'll see a yellow gamepad and on the next button, you should see a grayed out rectangle. Just click on it so that you are in Screen Recording Mode. Where it says "Primary Sound Device", choose "Default Sound Device". 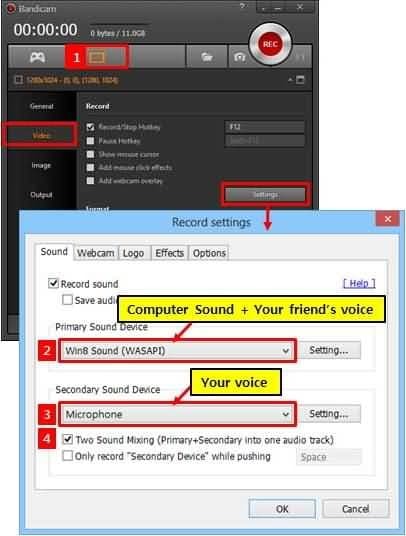 This is telling the software to record both your voice as well as computer sounds. Where it says "Secondary Sound Device", choose "Your Microphone". The last change that you need to make is to check the box that says "Two Sound Mixing". This is what will allow the software to mix both what you say and what others are saying in the same audio file. Now, you need to have the right Windows settings for Skype. Just go to Properties, click on Sound, and then on the Communications tab. In here, you'll need to select the option "Do nothing". You can check the volume mixer while you are talking. In order to do this, you'll need to open Skype on your computer. 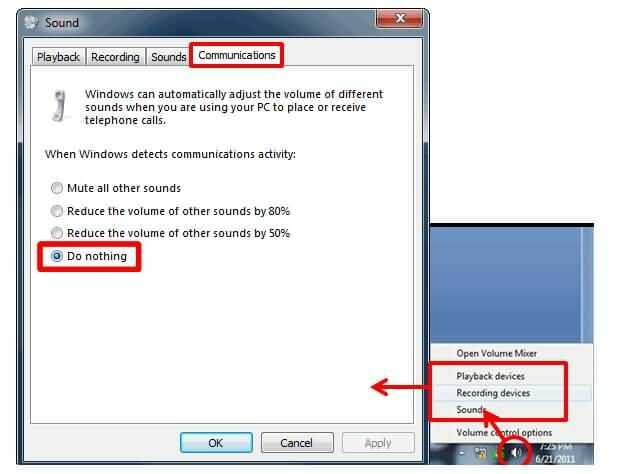 Please note that anytime you open Skype, it will automatically change your computer volume. So, just click on the "Tools" tab and select options. Then, on the left side of the new window that appears, you should be in the General Section. Here, you'll find the "Audio Settings". Just click on it since the settings that you need to change are here. Where it says "Microphone", make sure that you have the "Microphone" option selected and that the volume is near the high. Also, the box that says "Automatically adjust microphone settings" should be unticked. This will allow Bandicam to record your voice. Where it says "Speakers", choose "Speakers". Again, the volume should be near the high. This will allow Bandicam to record the other person's voice. Make sure that you also uncheck the box that says "Automatically adjust microphone/speaker settings". So, now it's finally time to test Bandicam. Just go ahead and open Skype. As soon as someone starts to call you on Skype, just click REC on the Bandicam frame. As soon as you do it, the software will record everything o your screen. When the call ends or if you don't want to continue recording the conversation, just click REC again. In order to access the voice recording audio file, you just need to open the Bandicam menu and right in the middle of it, you should be able to see a customizable file destination for recordings. Just click "Open" on the right, and you'll find your recording. 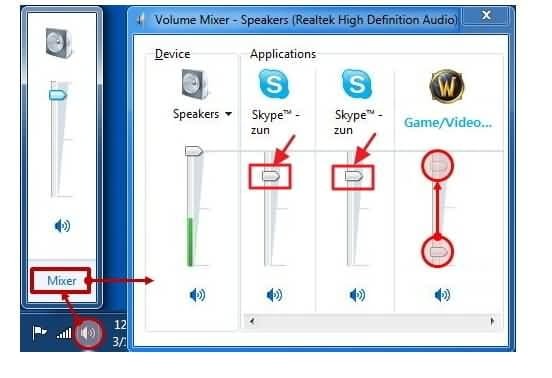 As we mentioned above, there are other software that also record Skype calls. One of the best examples, besides Bandicam, is Filmora scrn Screen Recorder Software. One of the best things about Filmora Scrn is the fact that it allows you to record from your webcam and from your computer, at the same time. Plus, an extra advantage that this software has compared with Bandicam is that you can completely edit your clips. Sometimes, you may just want to save a small part of the call that you recorded. So, why should you keep a bigger file? Adding other items is extremely easy as well. Items such as annotations, including text and other elements, music, video, images, and several other media files. In case you like to use both Windows and Mac, then you can be sure that Filmora Scrn is the best option for you.